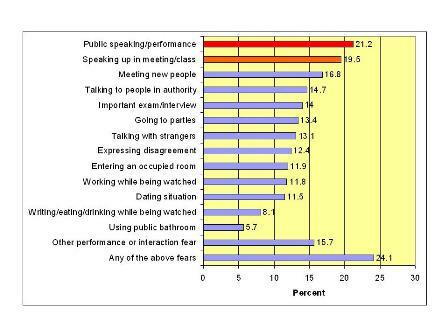 Fear Of Public Speaking Statistics. The Most Important Statistics In The World. The most important Fear Of Public Speaking statistics you will ever read are on this page. The graph below shows the results of a large recent study of social fears done in the USA. Public speaking fears do indeed appear to be the number one social fear held by Americans (and we have no reason to believe people in other countries would be much different). Speaking Up In Meetings/Class is a close second and I'd argue that it's also a form of public speaking. Most meetings, and probably every classroom have more than 2 people, so it involves speaking in front of a group. The study criteria, developd by the World Health Organisation (WHO), show that these fears are serious. Basically you don't register unless you have "either a performance or an interactional fear that was excessive and caused substantial distress, nervousness, or avoidance." The percentages shown in the graph are much higher than I would have thought for such serious fears. The Conclusion drawn by the study is quite alarming because it suggets problems like this adversely affect lots of people's lives. "Social phobia is a common, under-treated disorder that leads to significant functional impairment. Increasing numbers of social fears are associated with increasingly severe manifestations of the disorder." The Book Of Lists has the fear of public speaking at number 1 of all human fears. 60% of people get turned down for a job because they don't have good enough communicatin skills. There are more than 250,000 people in more than 12,200 Toastmasters Clubs in 106 countries and it's growing at 6.3% annually. According to Wikipedia the fear of public speaking affects between 75% and 95% of the population. All of the above is interesting but it pales into insignificance alongside another set of statistics. In every human endeavour there's normally one thing that's the critical number. In sales it's the number of qualified prospects you get in front of, in personal finance it might be your net worth or the number of days you can maintain your current lifestyle if your job income stopped today. In public speaking it's easy. Just count the number of minutes you spend speaking in front of a group of people. Whatever the number is right now, is what it is. Why not go back over the last 6 months and take a best guess. Great. Now what would it take to at least triple it? Make a plan and go for it. Make the next 12 months a year of no fear, and leave the fear of public speaking statistics where they belong - on someone else's CV not yours. Use the considerable resources available to you at this site to help you Understand, Love and Practice public speaking at a whole new level. The best place to start is by doing some of the public speaking exercises.